Not all banks are the same. But it turns out that many bank and credit union intranets fit similar patterns. Assiniboine Credit Union and ThoughtFarmer worked together closely to develop a user-friendly, fit-for-purpose intranet navigation. Over the years we’ve worked with many financial institutions. We’ve engaged with these clients in Professional Services projects of varying sizes, from speedy three-week get-’em-done’s to twelve-month behemoth efforts. While every company needs a unique intranet tailored to its employees’ needs and the company’s culture, some very noticeable patterns have emerged. There is one particularly direct way to gain social intranet adoption and deliver business value with your new intranet: Make it easy for customer-facing employees to find the information they need. These employees are often the face of your bank and their efficacy can shape customers’ experiences. By helping these employees quickly find information and do their jobs more easily you can increase their and customers’ satisfaction, which can directly impact the bottom line (see the Harvard Business Review article Beating the Market with Customer Satisfaction). Providing this information can also drive intranet adoption and help you make the case for investing in the intranet. But how exactly do you implement this on your intranet? From our many bank and credit union intranet implementations, one strong pattern that has emerged is a top-level navigation section for information about the bank’s products and services. Navigation Item #4 (Products & Services) above contains the real meat of a bank intranet. This is the material that employees need every day in order to provide stellar customer service. By consolidating here the information needed for answering customer questions, you reduce the amount of searching employees will need to do. By including this section in the global navigation you ensure the information is just a click away. 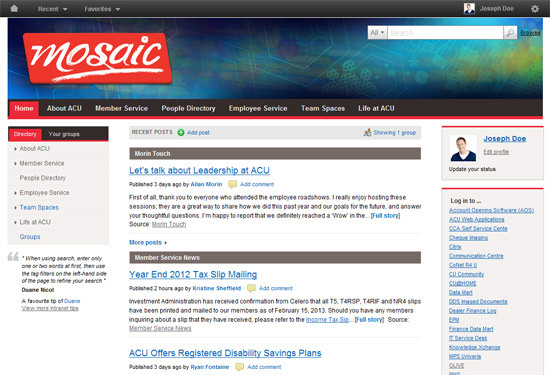 The real trick is to organize the content within this section so the navigation makes sense to employees. ​This information is not needed with as much speed as the other bucket of information, but is highly relevant to your front line people. This content may go in the “Products and services” area (which then might have a broader title, such as “Banking Services”) if that’s where employees look for it during user testing. Or it may go under the “Internal administrative” section — again, depending on the results of user testing. Maybe it will have its own section in the global navigation. No matter what, the decision about where this information goes should be based on iterative user input. Our Professional Services team does this most commonly through user-centered design techniques such as intranet card sorting and task testing. A final pattern we’ve seen is the focus on building a positive work environment. This includes online and offline efforts to keep employees engaged and enjoying their work, as well as helping them share their know-how. 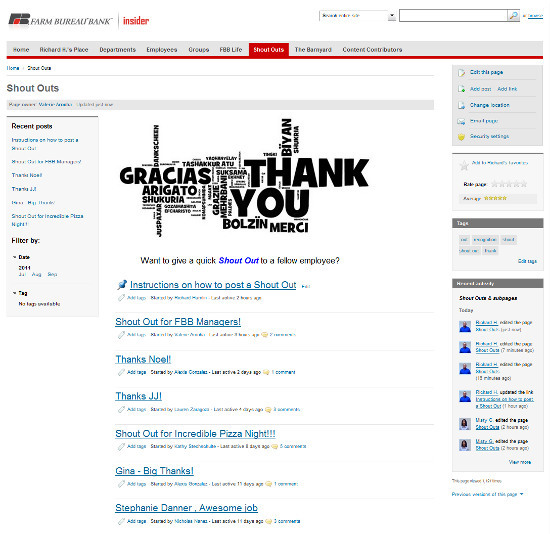 One of the most popular sections on the The Farm Bureau Bank’s intranet lets employees publicly thank each other. Community spaces for sports teams, recipe sharing, knitting groups, etc. We’ve seen many other creative ideas as well. The key is to create engaging uses of your intranet that fit your company culture and employees’ needs. ThoughtFarmer social intranet software works well here because of its core social features and flexibility. Read our white paper on social intranets and employee engagement for more examples, data and best practices in this area. Good luck out there! And if you have any questions, holler at our friendly team.